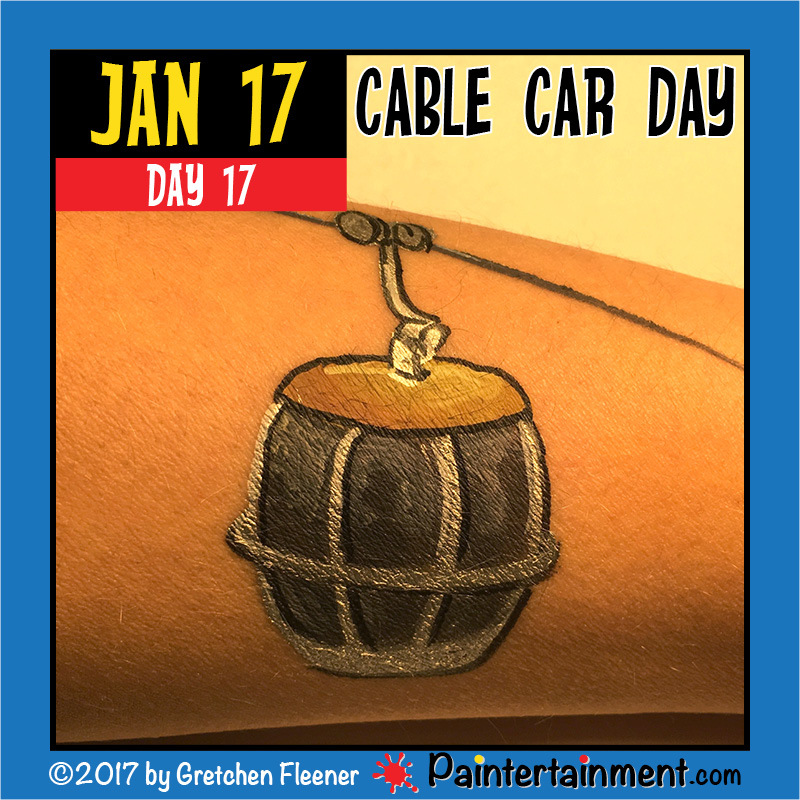 Whew...I've just completed a full month of posting daily paintings! I have to say, this has been a total blast! I've found myself doing so many things I've never done before: an ankle painting, a foot painting, pieces that involved the use of two hands, and even turned myself into a grizzly old man! I've painted pastries, pasta, animals, objects, modes of transportation, cartoon characters, morse code and even a questioning cat! This challenge has actually been a huge help in keeping me sane this month! If you're connected to me on Facebook, chances are you've been subjected to a bit of the moaning and groaning I've been doing over the completely mind numbing tasks I've been doing this past month: updating inventory, catching up on expense tracking in Quickbooks, generating 1099's for contractors, paying sales taxes, and taking some online college classes in financial and managerial accounting. In the midst of these not-so-creative tasks, it was really helpful to have that constant nudge to take a break and paint! 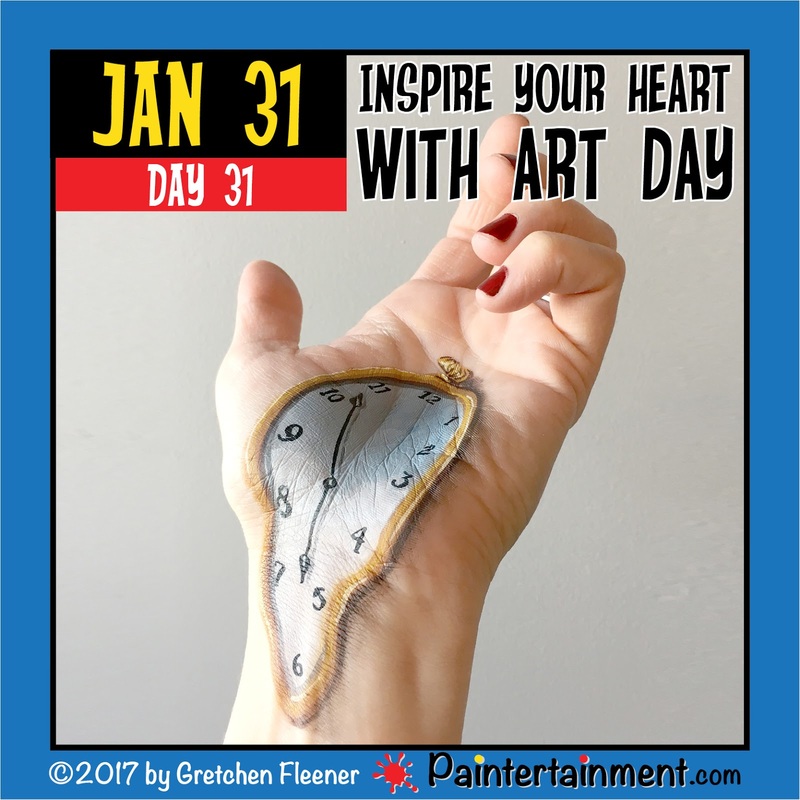 "Inspire your Heart with Art Day"
"Talk Like a Grizzled Prospector Day"
Celebrate Day 31: "Inspire Your Heart With Art" Day! Happy "Inspire your Heart with Art Day!!!" 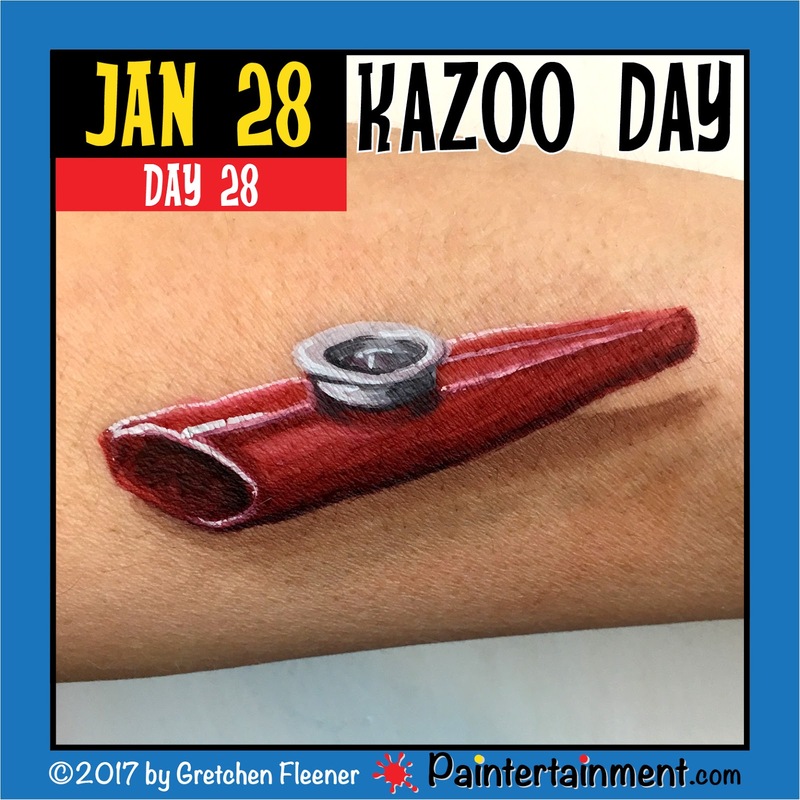 I can't think of a better excuse for my painty friends to get out their brushes and create something today!! In honor of this day, I decided to paint something inspired by another artist, the surrealist Salvador Dahli! While Dahli painted some really strange images, what I love about his work is that he still makes things recognizable and seemingly real, even though we know they are completely imaginary. This melting clock is of course inspired by "The Persistence of Memory!" Celebrate Day 30: "Bubble Wrap Appreciation Day!" To create this look I simply followed the process to paint water drops. A step by step tutorial on water drops can be found in one of my books, "Realism for Face and Body Artists!" 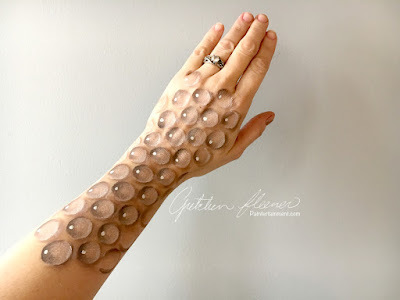 The same idea can be applied when painting other clear things, like tears, gemstones, and of course, bubble wrap! To speed up the process on this one, I created quick, uniform drops by triple loading a finger dauber! I had a little surprise free time yesterday when a gig got cancelled, so I took the opportunity to try out a little camouflage design! This one took about 20 minutes to paint, but you can watch me do it in super fast motion in my latest YouTube video! 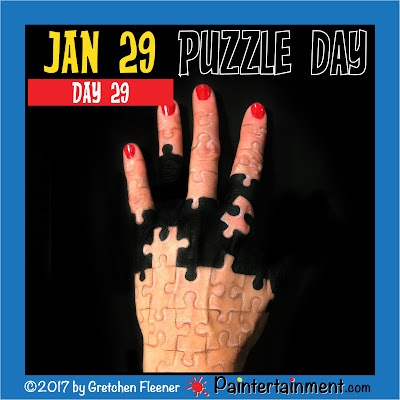 Celebrate Day 29: "Puzzle Day!" 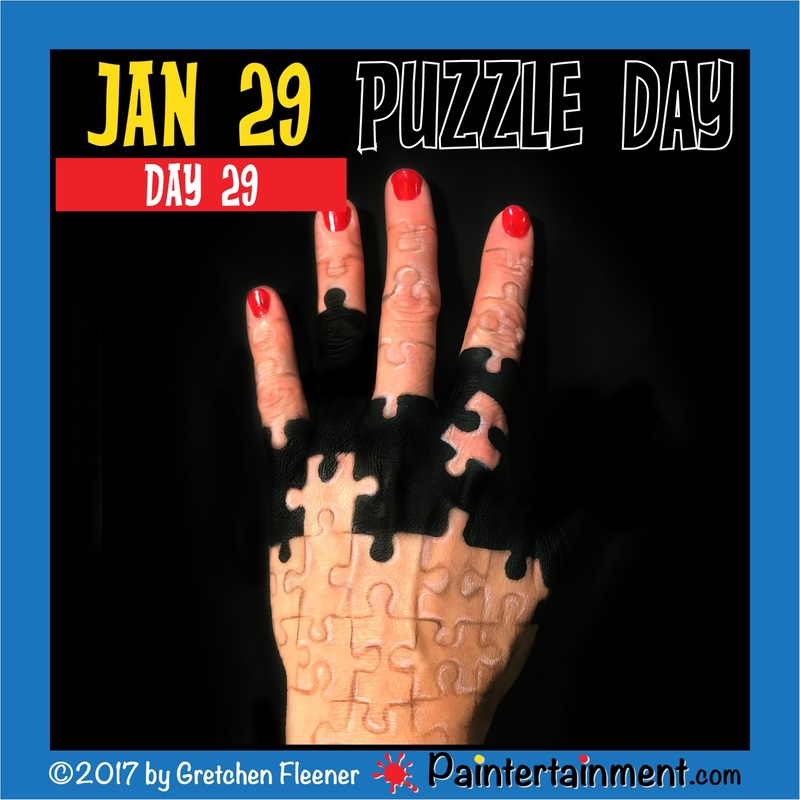 It's puzzle day! 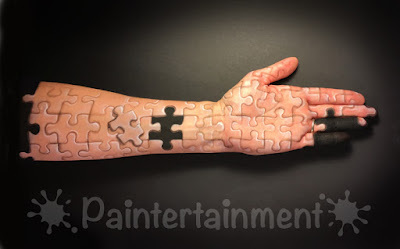 I've already done several puzzle paintings and thought about posting one of them today, but decided to just do another one! So, here it is! Below are a couple other puzzle designs I've done. You can watch me painting the arm design on my YouTube channel, here. Looking for a little help creating puzzle designs? 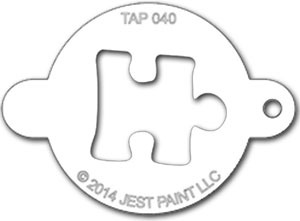 We actually carry a great little puzzle piece stencil! Find it here for just $2.50! Celebrate Day 28: "Kazoo Day!" Celebrate Day 27: "Chocolate Cake Day!" Oh my goodness! 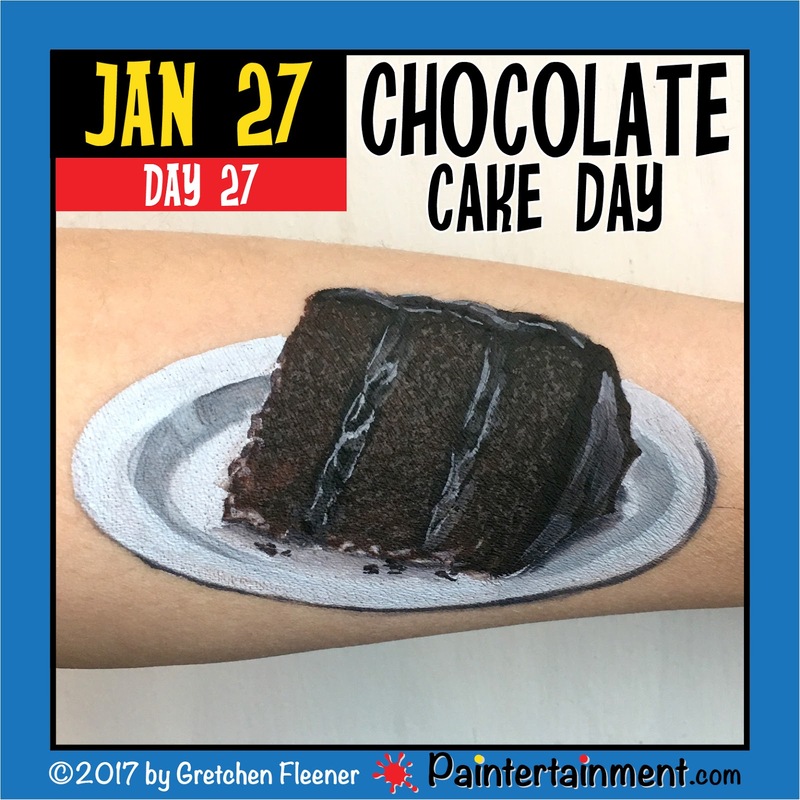 How have I gone through my entire life NOT celebrating chocolate cake day?!?! Chocolate cake and celebrations definitely go hand in hand. Therefore, you should definitely eat some chocolate cake today. You can probably tell by comparing the quality of this painting with my "pie day" painting that I'm more of a chocolate cake fan than a pie fan, haha! Whenever presented with a dessert menu, I ALWAYS choose the item with the most chocolate! 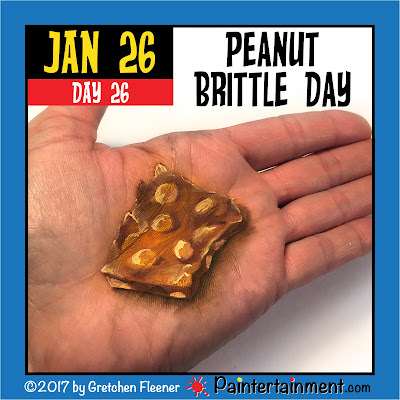 Celebrate Day 26: "Peanut Brittle Day!" 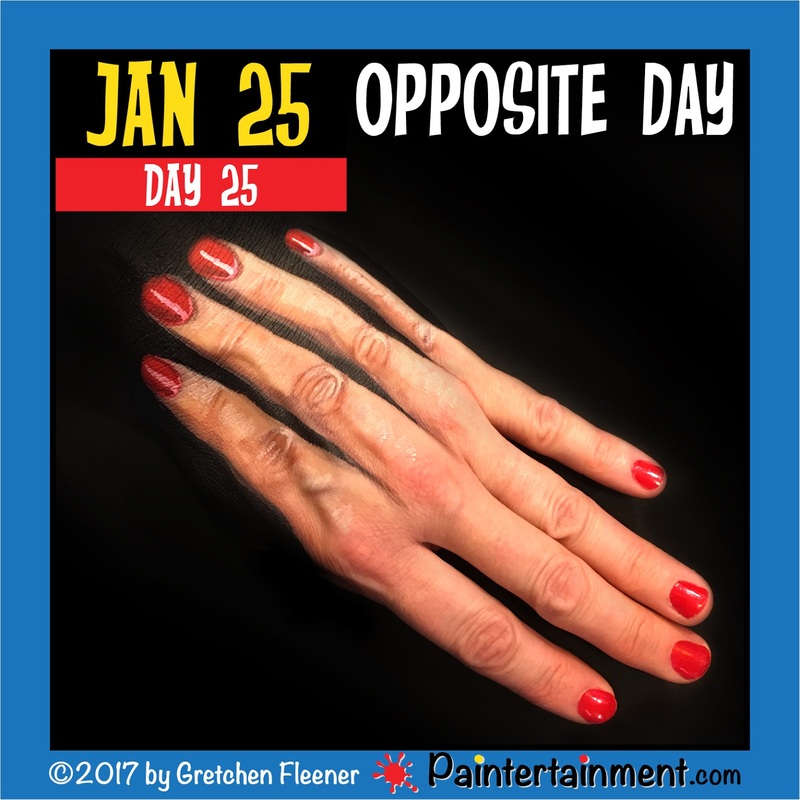 Celebrate Day 25: "Opposite Day!" 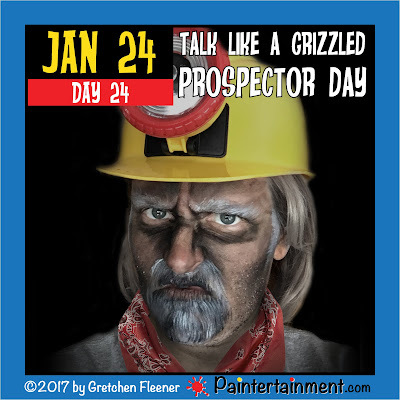 Celebrate Day 24: "Talk Like a Grizzled Prospector Day!" Today is "talk like a grizzled prospector day!" While I've turned myself into an old woman and even Large Marge in the past, I had yet to make myself into a man...until now! 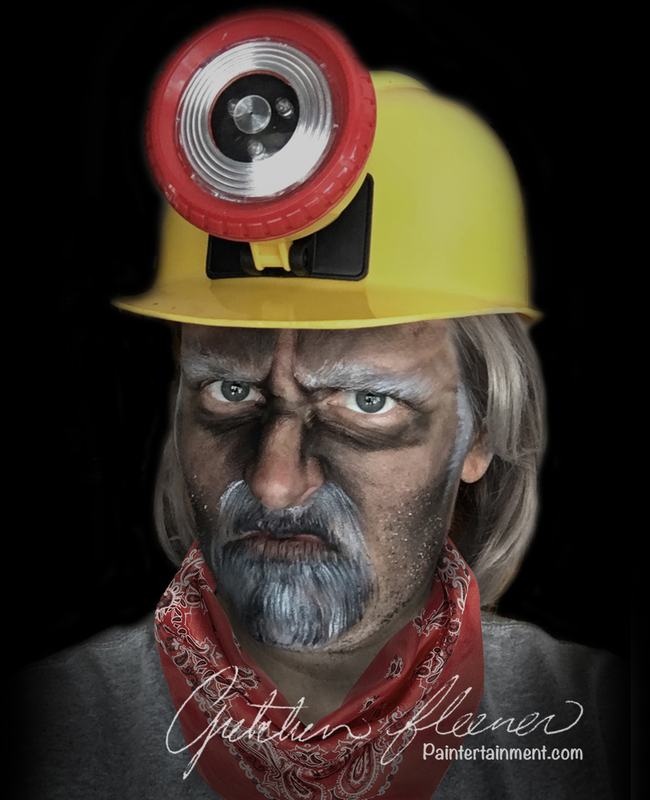 I may have creeped my son out just a little bit when I knocked on his bedroom door painted like this, asking to borrow his hardhat...haha! Looking to create that grizzly look yourself? I used a dry, fluffy kabuki brush to apply the dirty skin base. The beard effect was achieved with my rake fan bristle brush, and a coarse stipple sponge is fantastic for stubble!! 5 Steps to Set Yourself Up for Success in Paint Challenges! 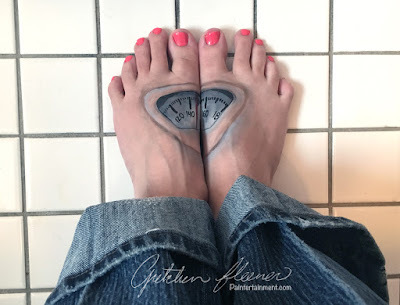 If you're a professional face and body artist, it's nearly impossible to scroll through your social media feed without a glimpse at some sort of challenge. There are Facebook groups for challenges, monthly challenges, weekly challenges, and even some that offer awards and prizes! I have always loved taking on unique challenges and competitions, as they make me stretch, grow, and paint things I never would have painted otherwise. 2017 will DEFINITELY not be any exception, but quite the opposite for me! Now that I've gotten through the first few weeks of this challenge, I wanted to look back at the reactions I’ve noticed from my fellow painters to the challenge, and offer some encouragement to all of my painty friends in 2017! 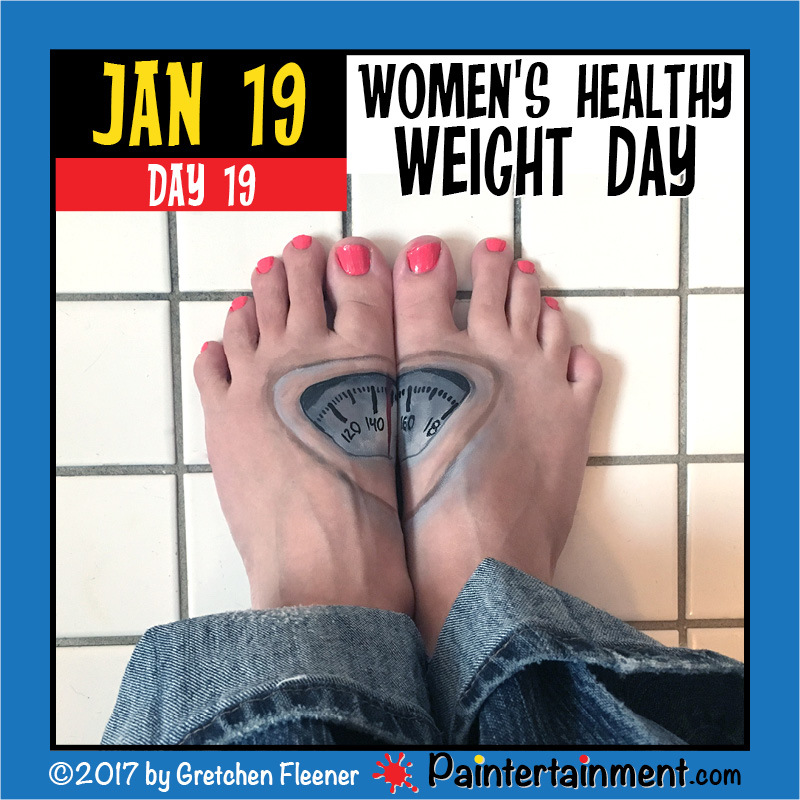 I’ve heard everything from “wow, that’s quite a commitment,” to “I WISH I could do that.” And today I want to tell you, you CAN! But most importantly, if you can’t do it perfectly, so what?! ‘Tis better to have tried and failed, miserably even, than not to have tried at all, right?! What is it that makes us so afraid to accept challenges like this? Especially this time of year...so many people are afraid to set any goals or resolutions for fear of failure. Sure, I may very well miss a day here and there, I may fall behind, or I may even stop early alltogether. But that’s not the point...the point is that I am trying. It’s not important whether I succeed or not...what’s important is that I try. After all, what good are awesome ideas if you never try them? So let’s break down this challenge. The scariest part is the frequency...every day. That’s 365 paintings over an entire year. Every. Single. Day. How can I possibly do something every day?! Think about all the things you do every day that aren’t even that particularly enjoyable. I bet you can come up with a pretty long list. If I can make time every day to unload the dishwasher, brush my teeth, and change my underwear why can’t I make time to do a little painting? Sure, I may do several days' worth of paintings on a day when I have more time to dedicate to it, but having that pressure to post something every day will ensure that I keep painting regularly, and keep painting things I wouldn't normally paint. Who knows what it may lead to?! So take a chance on yourself this year! Don’t be afraid of not following through with perfection. Be brave enough to chance failure. 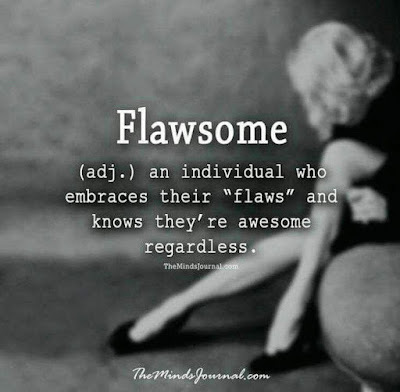 Be FLAWSOME! The lessons you learn along the way are the real achievement! Find a spot in your home where you can keep your paints set up & ready to go 24 hours a day, to avoid the setup and tear-down time. If step 1 is tough for you, make a mini kit dedicated to your practice challenges. This way you don’t have to ever pack it up for a gig. 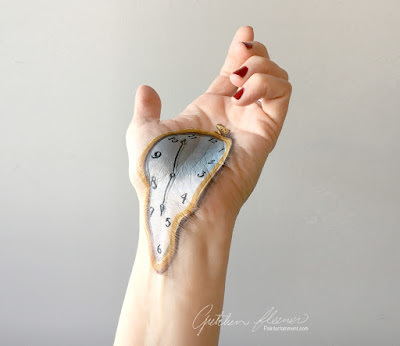 Whether it's setting reminder alerts in your smartphone, writing it on your calendar, or sticking a post-it on your mirror, find a way to remind yourself to paint! Keep a running list of subject matter ideas ahead of time so you can get straight to the painting when you're ready! Nothing slows you down like staring at a blank canvas with no ideas. Take photos of everything you paint & keep them in one spot where you can easily look back at your accomplishments. Look back often and see your progression! Best of luck to you! If you've decided to challenge yourself after reading this, then congratulations! You've already won!! 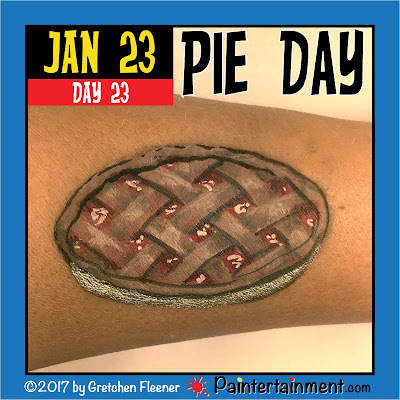 Celebrate Day 23: "Pie Day!" Well now, there's a day I can get behind...PIE day! Whatever your favorite flavor, be sure to enjoy some pie today! Not doing so would be completely un-American!! Celebrate Day 22: "Answer your Cat's Questions Day!" Okay, I admit, this one sounds a little bit crazy...but it was the ONLY option for January 22nd! I'm not sure how you are supposed to ASK your cat what their questions are, let alone answer them, but here you go. 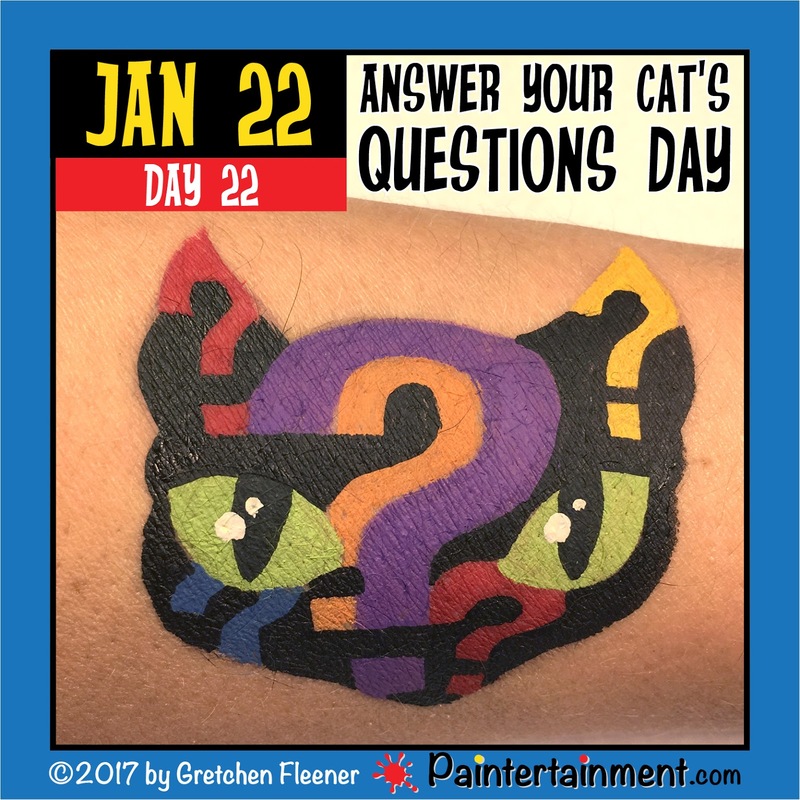 My interpretation of "Answer your cat's questions day!" 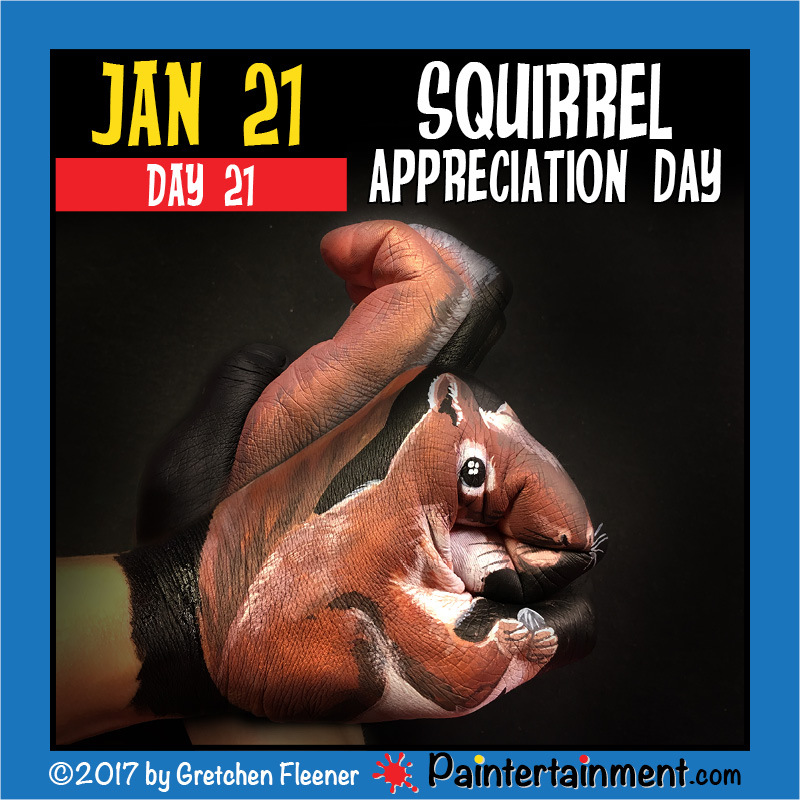 Celebrate Day 21: "Squirrel Appreciation Day!" 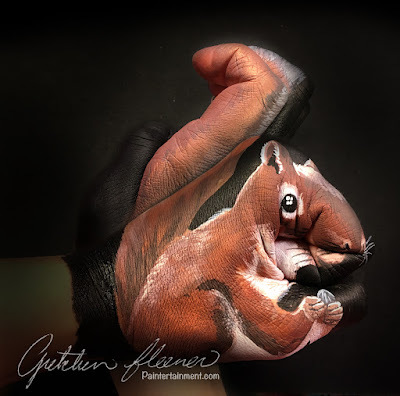 Have you appreciated a squirrel lately? I can tell you that I am guilty of not appreciating squirrels. They dig up my garden, leaving my baby tomato plants to grow in random places throughout my yard. They also steal birdseed with gusto. If you saw all of the squirrel memorabilia my grandma has, you'd think she was a squirrel appreciator, but I'm pretty sure she hates them more than I do. She had a squirrel that got into her house once, shredding the drapes, pooping on stuff and inducing general terror. She is now the reluctant recipient of all sorts of squirrel themed gifts for Christmas and birthdays. Poor Grandma. 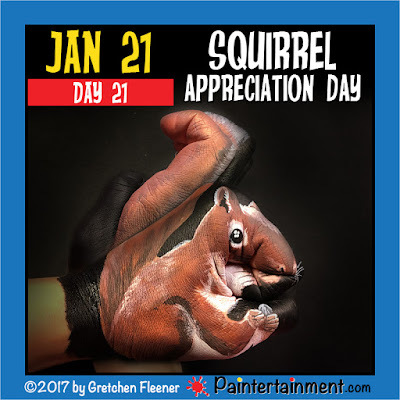 In honor of these awful, thieving rodents, I painted one on my hands! 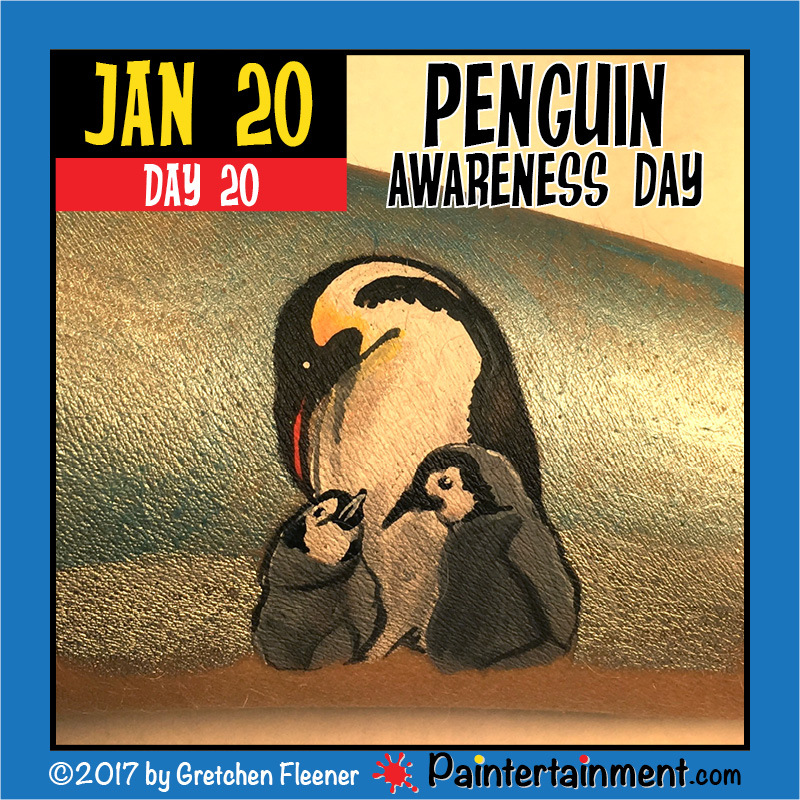 Celebrate Day 20: "Pengin Awareness Day!" Are you aware of penguins? Well you are now! You're welcome!! :-D Happy Penguin Awareness Day!! Got a penguin themed party coming up? Well, of COURSE you do! Luckily, I can both paint AND twist penguins!! 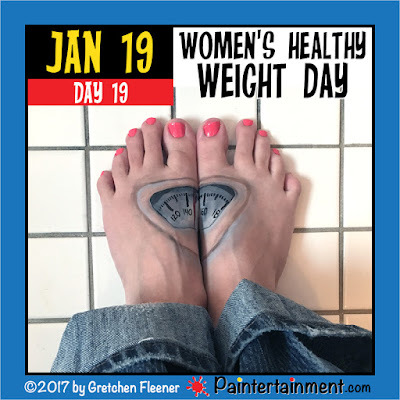 Celebrate Day 19: "Women's Healthy Weight Day!" 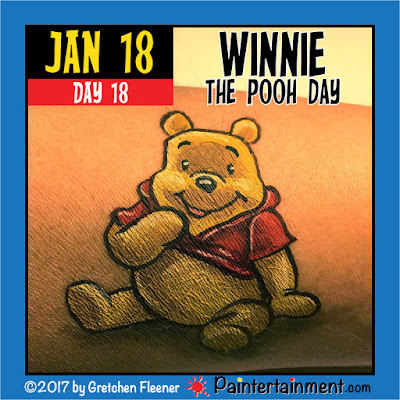 Celebrate Day 18: "Winnie the Pooh Day!" 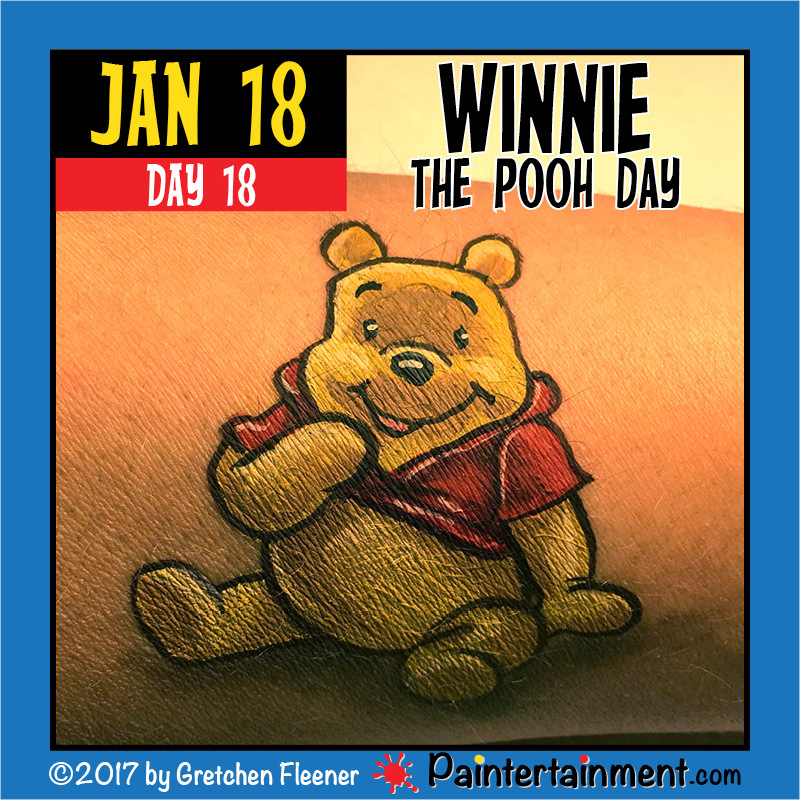 Who doesn't love Winnie the Pooh?! I've painted this little guy more times than I can count over the years, along with his buddies. He never goes out of style! 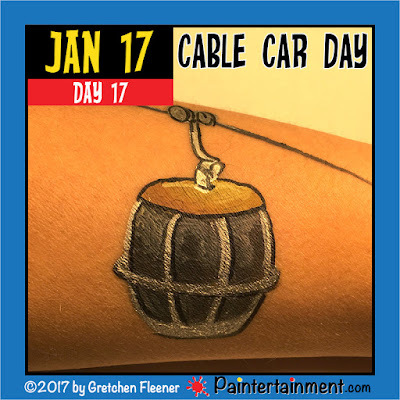 Celebrate Day 17: "Cable Car Day"
Happy Cable Car Day!! Well, this surely isn't something I thought I'd ever paint on myself, but then that's the fun of the challenge, isn't it?! I've had the pleasure of experiencing this awesome mode of transportation several times...I highly recommend it! 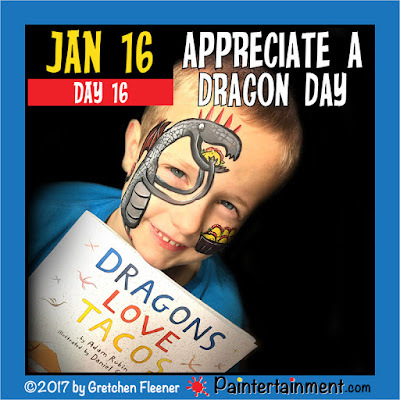 Celebrate Day 16: "Appreciate a Dragon Day!" Dragons just don't get the love and appreciation they deserve every day, hence the need for "appreciate a dragon day!" I wasn't really thrilled to do this one...after all, there's nothing unique about a face painter painting a dragon. It might as well be butterfly day or tiger day. But when I mentioned to my almost-7-year-old Toby, he let out a huge gasp and said "MOM!! Dragons Love Tacos!!!" Want to see more of this ADORABLE boy and his equally adorable brother?! Check out my book, "Painting Boys!" Celebrate Day 15: "Strawberry Ice Cream Day"
Happy strawberry ice cream day! Ice cream is definitely one of my big weaknesses. It's also one of the things I've always enjoyed painting on my arm! 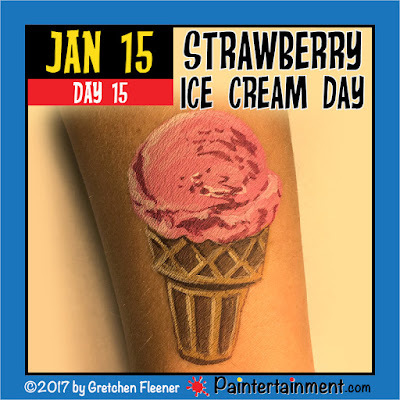 During slow times at the amusement parks I worked at in high school, I used to paint huge stacks of ice cream scoops going up my arm, and of course always included a scoop of strawberry. Celebrate Day 14: "Organize your Home Day"
Did you make a resolution to become more organized, but have been putting it off these past two weeks? No worries...you MEANT to procrastinate, right? Of course you did! 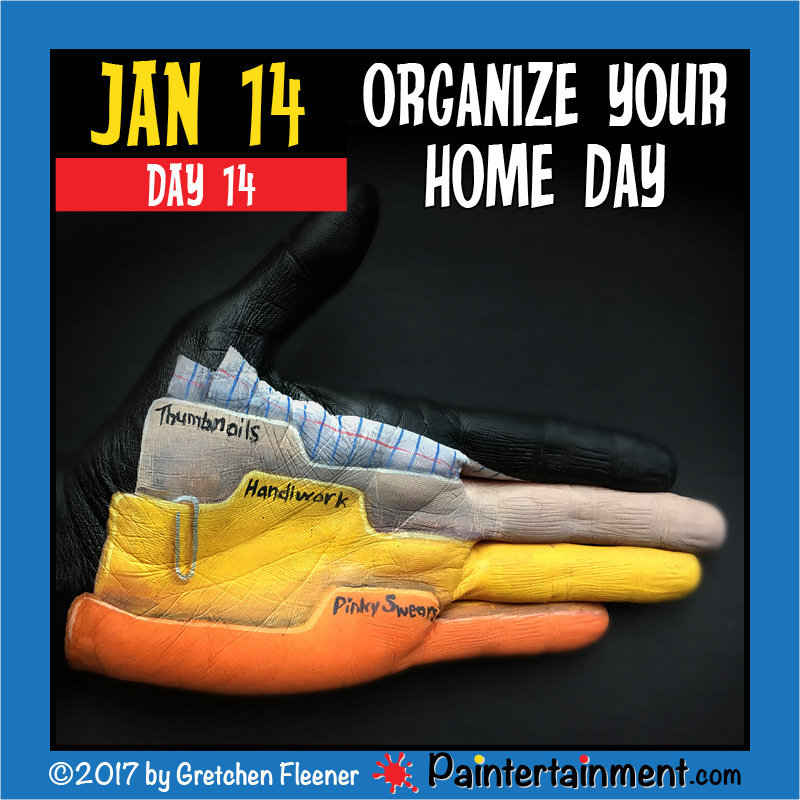 You were just waiting for "Organize your Home Day!" In honor of this special day, I've painted some file folders on my hand! Yet another subject matter I never would have thought to paint, had I not given myself this crazy challenge, haha! Celebrate Day 13: "Rubber Duckie Day!" 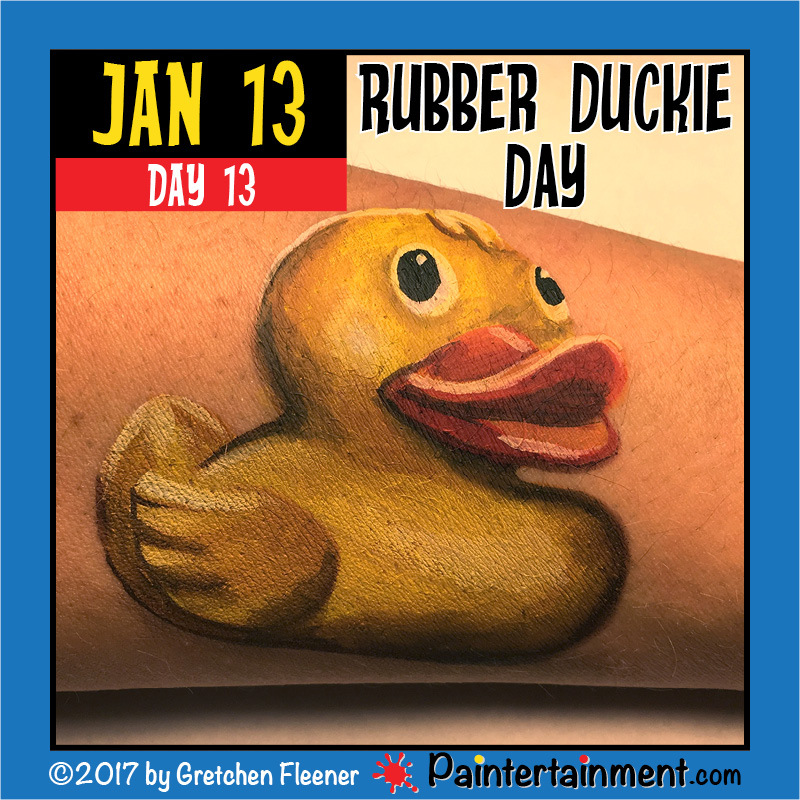 It's rubber duckie day! About 7 or 8 years ago I used to face paint at a weekend long city festival that had a huge rubber duckie race in the river! They'd release hundreds of rubber duckies into the river, reigned in by a floating "track," and whoever's duckie reached the finish line first won the grand prize! It was always super fun to watch! 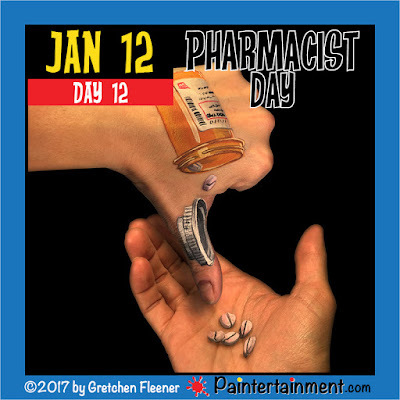 Celebrate Day 12: "Pharmacist Day!" 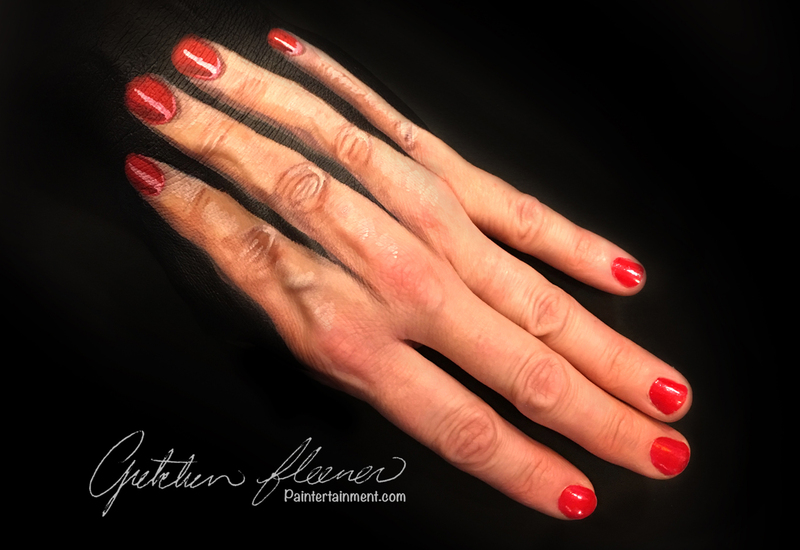 This is the first time I've done a hand design that involved two hands...a super fun challenge! 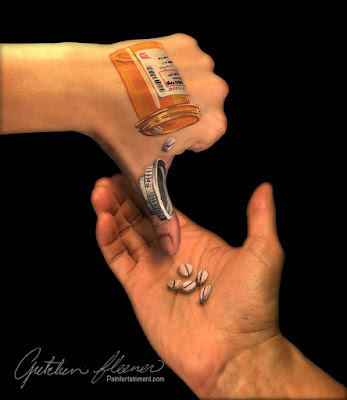 And in case you're wondering, I did not paint the pills left handed...both are actually painted on my left hand, but I reversed the photo of the hand holding pills in Photoshop and then layered the two together to achieve the overall look. 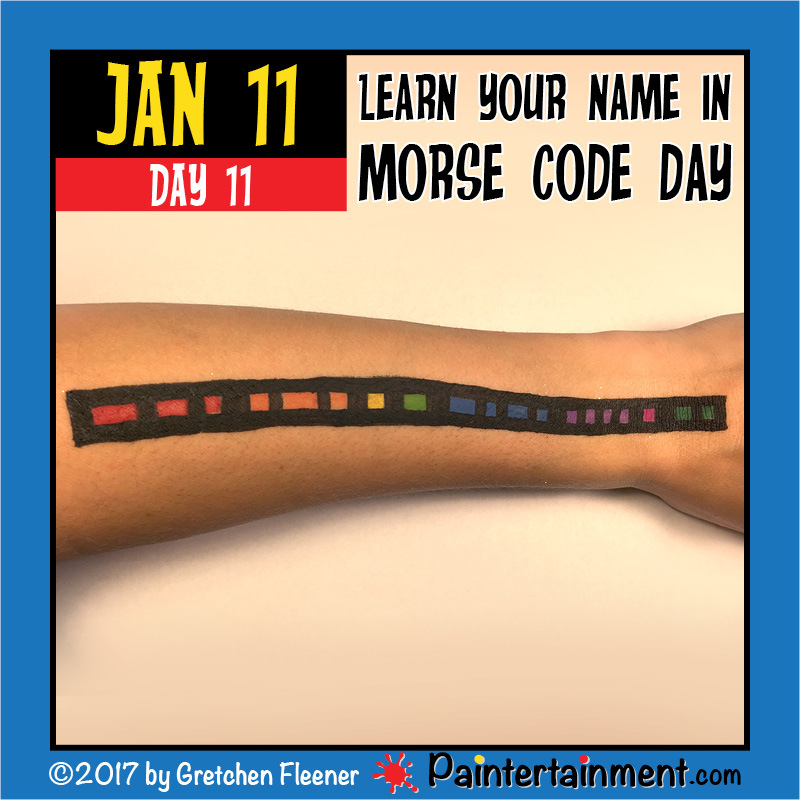 Celebrate Day 11: Learn Your Name in Morse Code Day! 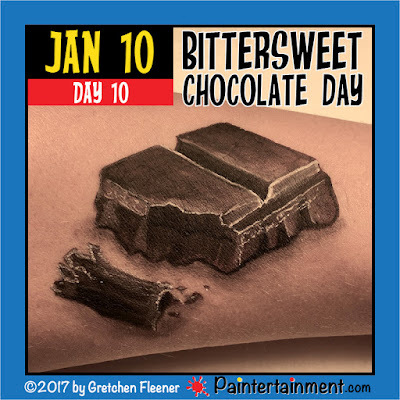 Celebrate Day 10: "Bittersweet Chocolate Day!" 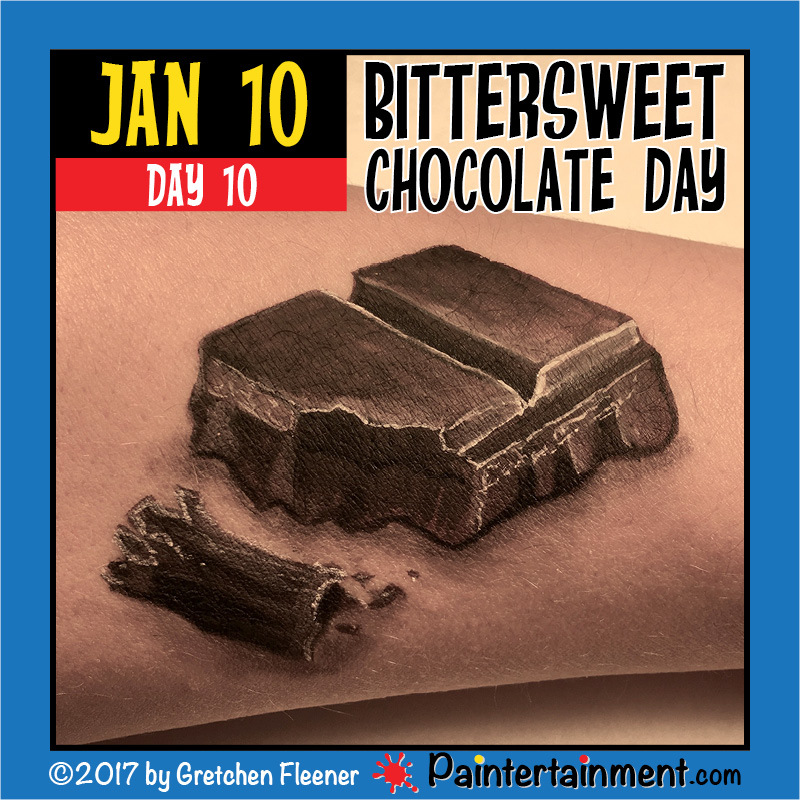 Happy Bittersweet Chocolate Day! Today is also "houseplant appreciation day," "Peculiar People day," and "cut your energy costs day!" However, being the chocolate lover I am, I had to go with this one!! Have you ever hired an entertainer for your party who left a bitter taste in your mouth? 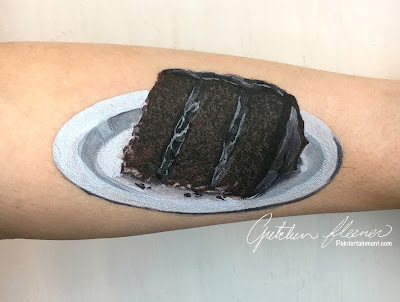 Sweeten up your next event with a talented professional from Paintertainment! 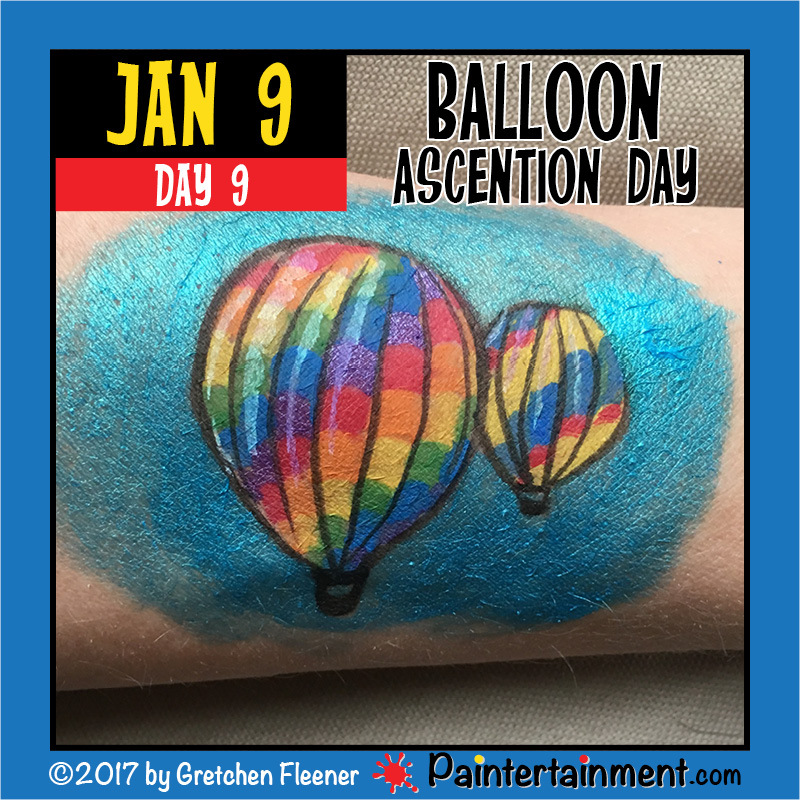 Celebrate Day 9: "Balloon Ascension Day!" 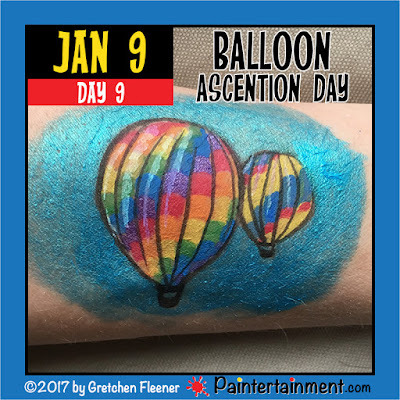 Looking for balloons that can be thoroughly enjoyed with two feet firmly planted on the ground? You're in luck...we do that! Check out the website for everything from balloon animals to large decor. And if you're a balloon twister yourself, pick up some supplies in our shop, here! 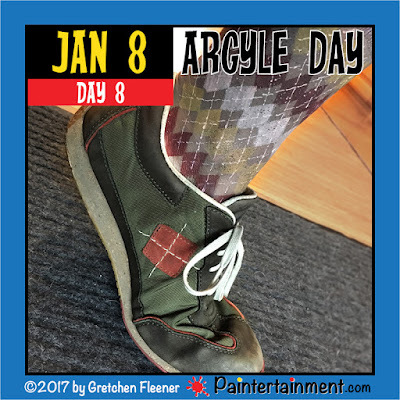 Celebrate Day 8: "Argyle Day!" Aaaah...Argyle! 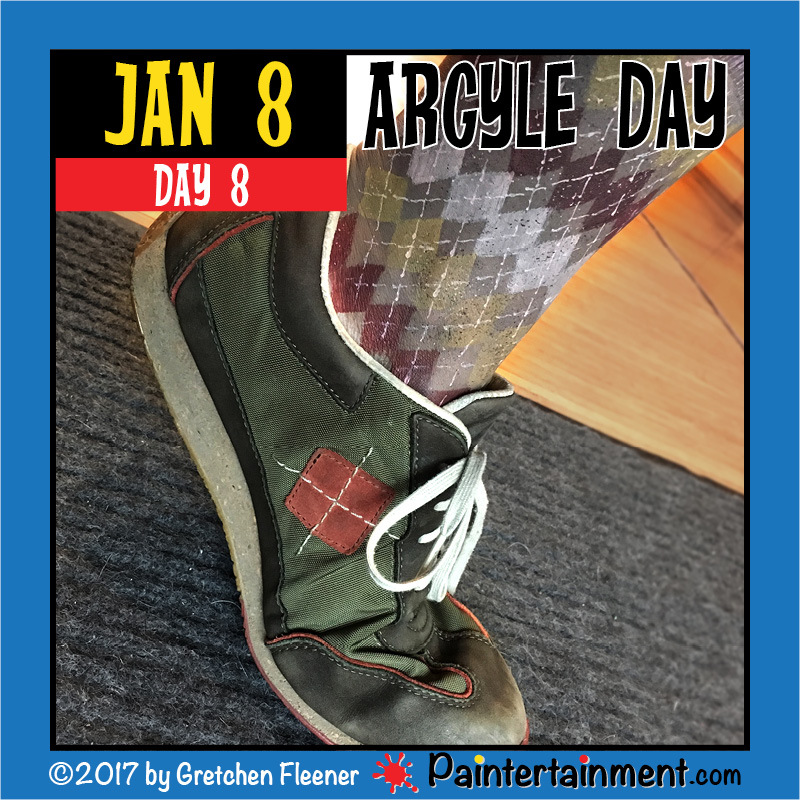 January 8th is apparently the day to celebrate all things argyle! 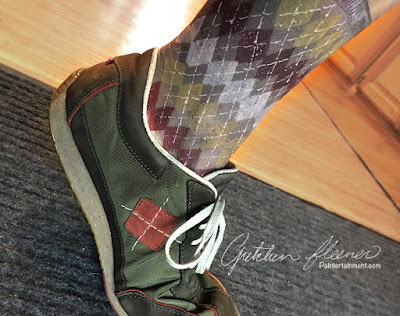 Argyle makes me think of golf and grandpas' socks! Oh, and one of my favorite pair of shoes that I'm wearing in this painting I did of argyle socks on my ankle, haha! Are you an artist looking for tips and tricks for painting realistic fabric? 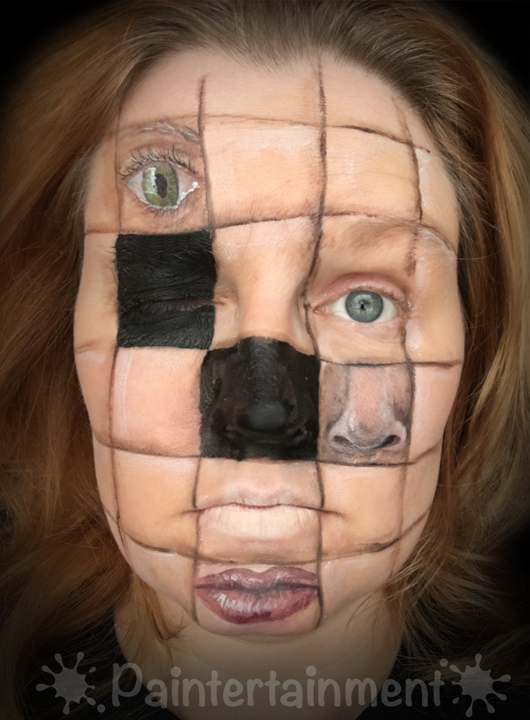 Check out my book, "Realism for Face & Body Artists!" I have a whole section on different types of fabric folds, and how to get a nice denim texture! 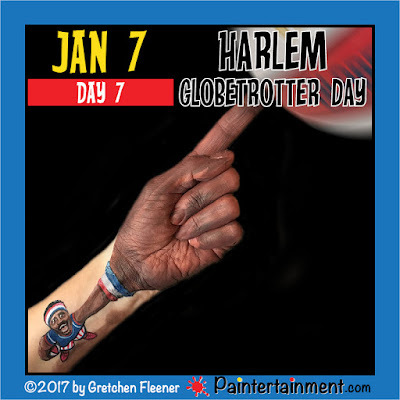 Celebrate Day 7: "Harlem Globetrotters Day!" It's January 7th...Harlem Globetrotters Day! 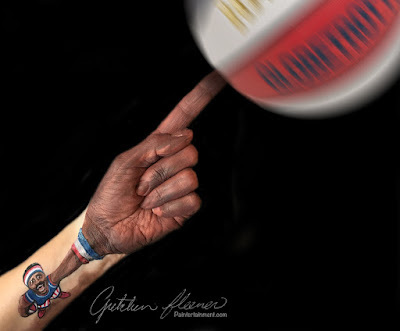 Here's my hand/arm painting tribute to the Globetrotters!! Looking for the next best thing to having the Harlem Globetrotters at your upcoming event? 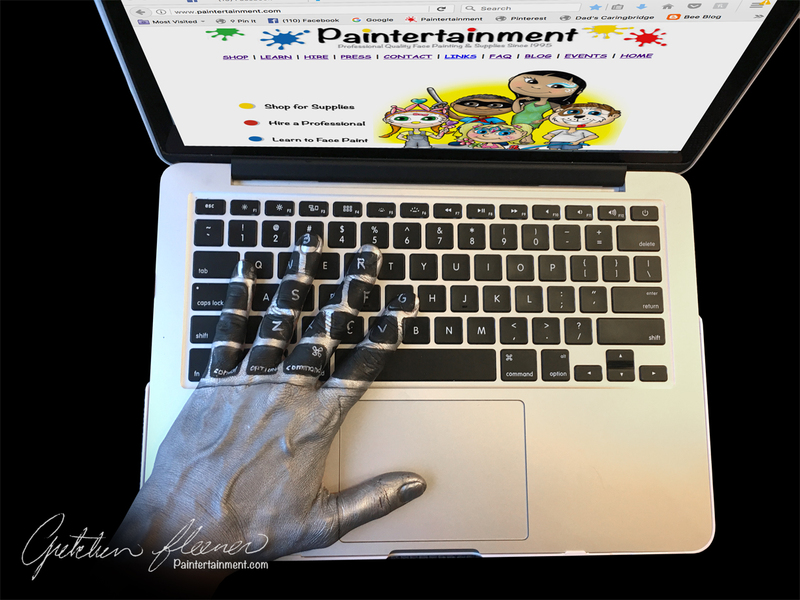 Try Paintertainment! 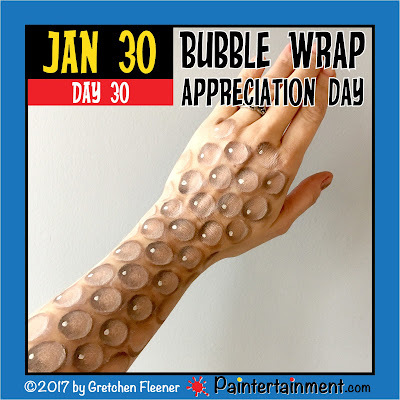 Click here for an explanation of what these "Celebrate Day" posts are all about! 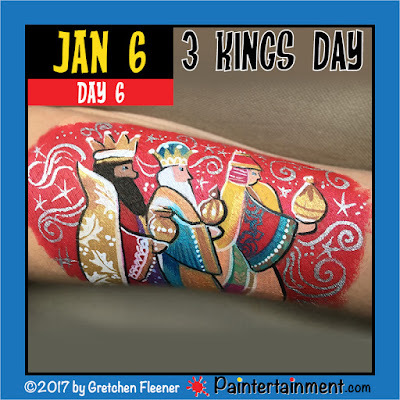 Celebrate Day 6: "Three Kings Day!" Happy Three Kings Day! 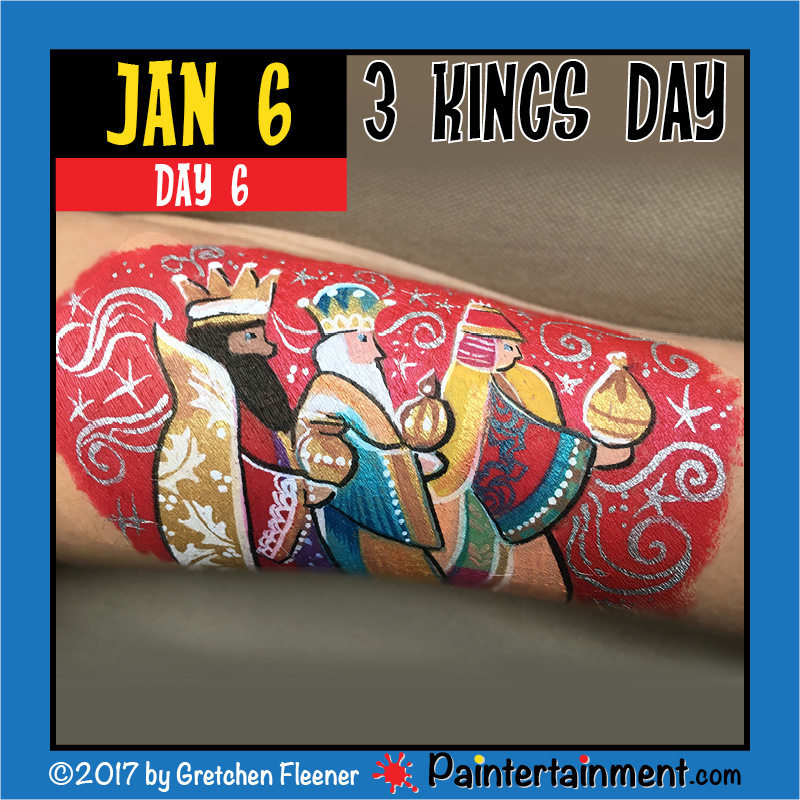 There are so many cool illustrations online of the three kings for inspiration...but I had fun with this one on my arm, doing some ornate patterns and textures, and mixing matte and metallic paints! Looking for the perfect gift for the kid who already has a room full of gold, frankincense and myrrh? Get them a face painter, balloon twister, henna artist or glitter tattoo artist for their celebration instead! Celebrate Day 5: "Bird Day!" 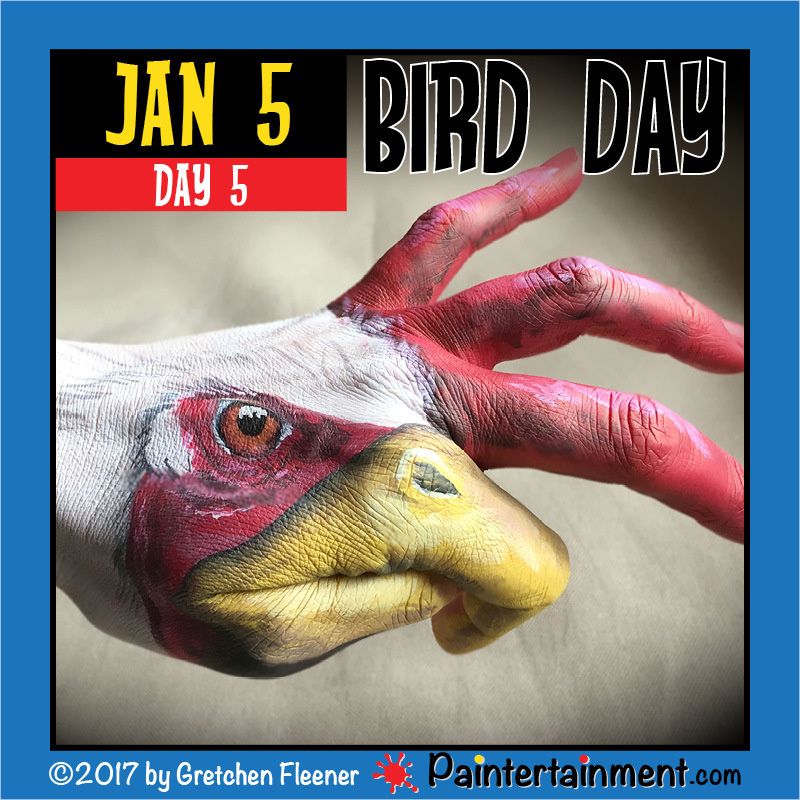 January 5th is Bird Day! Of course there are zillions of birds I could paint. 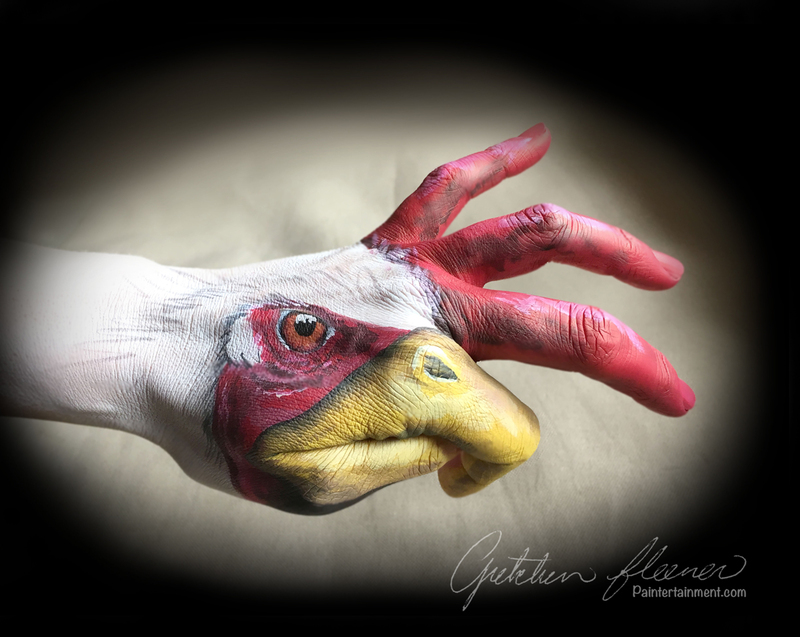 But, today I wanted to attempt to re-do an old favorite, my rooster hand. Many years ago, during a lull in the crowd at the county fair, I painted my left hand like a rooster. 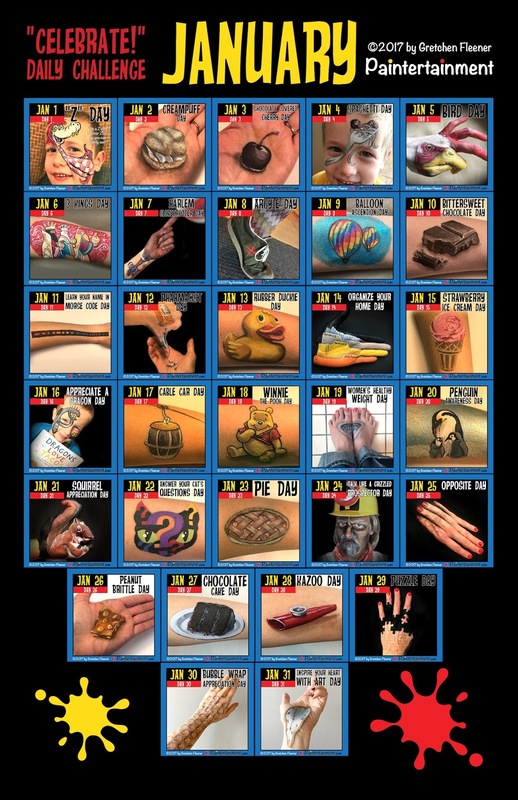 It was my first full hand painting, and spurred the idea to publish my "Funny Fingers Hand Art" book! However, as with many of my old paintings, I looked back and thought, "I can do better." So, here's a Rooster Re-Do! Got a reason to celebrate something else coming up soon? 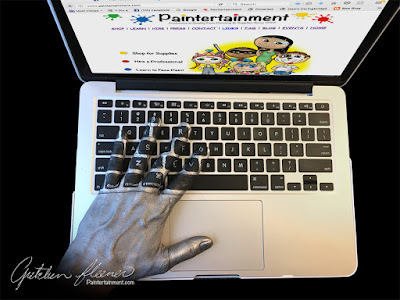 Invite Paintertainment! 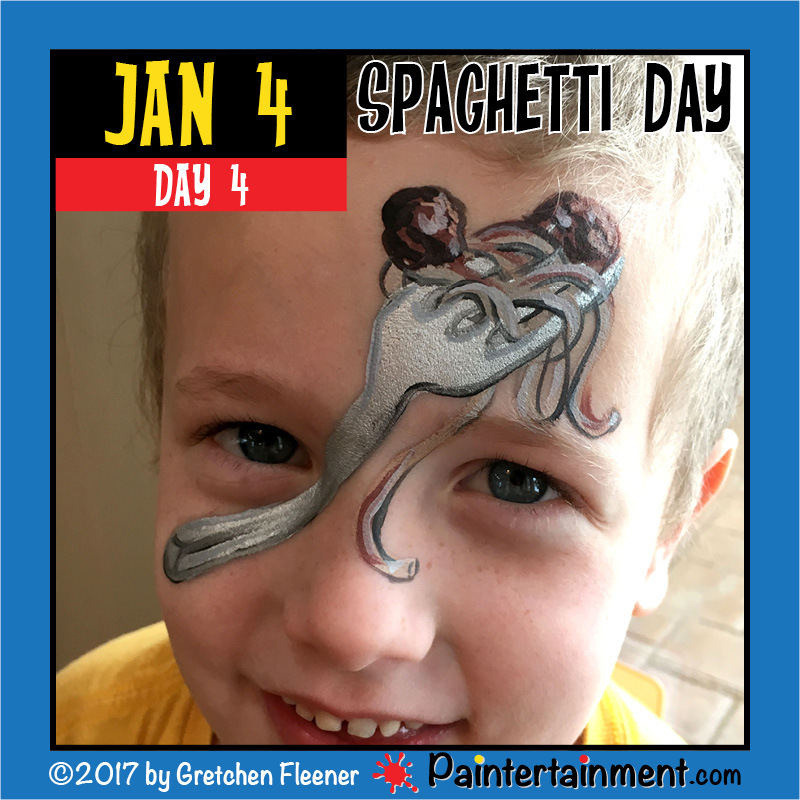 Celebrate Day 4: Spaghetti Day! Got a birthday coming up in your house soon? Along with making spaghetti or the birthday chil's meal of choice, why not invite Paintertainment to add an extra awesome factor?! 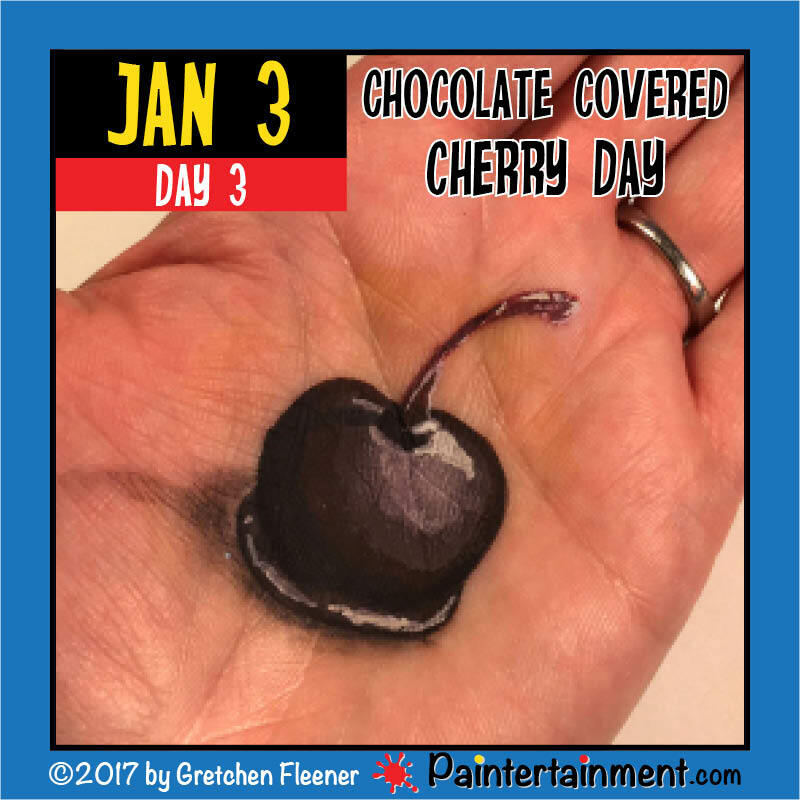 Celebrate Day 3: "Chocolate Covered Cherry Day!" Jackpot...two "sweet" days of celebration in a row! I love chocolate covered cherries! My brother does not. However, he gets a box of them from my grandma every year on his birthday, which he shares with George Washington...she says, because he chopped down the cherry tree. But ironically, the whole cherry tree story meant to teach us the value of telling the truth is itself untrue. Much like my brother's love for chocolate covered cherries. Bwahaha! Got a celebration of your own coming up? I cannot tell a lie...you won't regret it if you invite Paintertainment to help make it unforgettable! 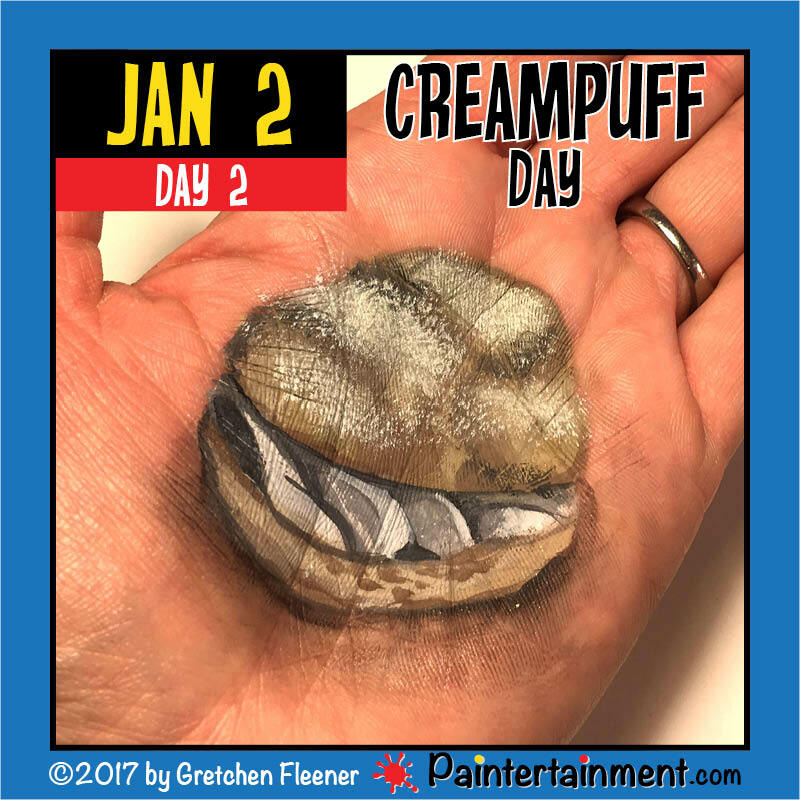 Celebrate Day 2: "Cream Puff Day!" What better way to celebrate January 2nd than with a delicious, fresh baked creampuff?! I love celebration days that give me an excuse to eat something yummy! Consider it your civic duty to go out to your favorite local bakery today and celebrate with the real thing! ;-) Happy Painting! Got a celebration of your own coming up? Invite Paintertainment to help make it unforgettable!